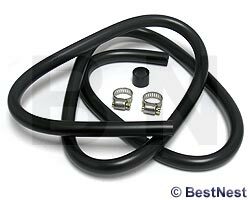 This Gilmour Hose and Screw Clamp Kit is a general PVC hose replacement system for Gilmour Traditional, Back Saver, Standard, Light Duty Utility, and Deck Sprayers. The metal clamps keep the hose in place on your sprayer, and the plastic sleeve helps make a secure connection. Maintain your Gilmour garden sprayer with this Hose and Screw Clamp Kit. Lifetime replacement policy.